Details of more than 85 million users of video sharing site Dailymotion have been hacked, according to Leakedsource. The breach detection company said 85.2 million usernames and email addresses and 18 million scrambled passwords had been stolen on 20 October. But the passwords were protected with the Bcrypt hashing algorithm, which should make it hard for hackers to access accounts. In a blog, Dailymotion advised all its users to change their passwords. 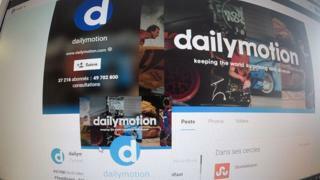 Dailymotion said the impact of the breach was limited and no personal information had been lost. It said: "It has come to our attention that a potential security risk, coming from outside Dailymotion may have comprised the passwords for a certain number of accounts." It also passed on advice about how to come up with a hard to guess password and said users should not use simple word and number combinations such as "password1234". Commenting on the hack attack Mark James, a security specialist at ESET, said: "Check and change your passwords on this site, if you have used that same password on any other site then change those immediately and possibly consider a password manager if you're not already using one. "Without further information about what was or was not stolen, we won't know the extent of the damage - but needless to say more data being added to your already overflowing online profile floating around the web is not good for any of us." Based in Paris, Dailymotion is owned by media group Vivendi. It launched in 2005 and is ranked as the 113th most popular website in the world, according to Alexa rankings. This year has seen a series of massive data breaches, with experts saying there are now 1.5 billion stolen credentials available to hackers and attackers online.